Cytokines play an important role in host defense against microorganisms. They orchestrate innate immunity by inducing protective local inflammation and systemic acute phase responses. Cytokines are important in initiating, amplifying, directing, mediating, and regulating adaptive immunity. Unfortunately, they may also direct tissue damage if excessive responses occur or if they are involved in directing and mediating autoimmunity. Under these circumstances, cytokines are potential therapeutic targets. Over the last 20 years, we have seen the successful development and clinical implementation of biologic strategies that target key cytokines in specific inflammatory diseases with efficacy, specificity, and toxicity profiles challenging conventional drug therapies. These therapies are finding new applications and many new agents show promise. Unfortunately, these new cytokine-based therapies have had little effect on renal disease. This review provides evidence that common renal diseases, including those causing AKI and the autoimmune proliferative and crescentic forms of GN, have cytokine mediation profiles that suggest they would be susceptible to cytokine-targeting therapeutic strategies. Cytokines amplify and direct the generation of appropriate patterns of immunity to combat particular microbial threats. These same cytokines can cause host tissue injury if the activation/amplification of host defense is overexuberant, as occurs in some infective and sterile forms of inflammation. These pathologic cytokine-driven outcomes are seen in many types of AKI caused by physical, drug, chemical, and ischemic injury. If immune tolerance is lost and host tissue antigens become autoimmune targets, cytokines can direct and mediate inflammatory autoimmune diseases. Important renal examples are the autoimmune forms of inflammatory/crescentic GN. Cytokines act in concert to generate inflammation in host defense and disease, but some cytokines attenuate inflammation and induce repair. Individual cytokines can be inhibited by antibodies or competitive receptors or by the therapeutic use of immunomodulatory cytokines. These biologic agents are now widely used to treat inflammatory diseases. There are a number of common renal diseases that could potentially be treated by targeting cytokines. This review will address these issues. Cytokines are glycoproteins that regulate the functions of the immune system. Definitions are imprecise because of redundancy of function and the capacity of tissue parenchymal cells and leukocytes to produce them. Hence the terms lymphokine and monokine have been dropped. Originally described by their perceived major function, the term IL has been adopted. When an agreed characterization of a cytokine is broadly accepted, a number is attributed (e.g., IL-6). However, the use of descriptive names for some key cytokines persists, including IFNs (α, β, and γ), TNF (TNF-α and TNF-β), colony stimulating factors (granulocyte colony–stimulating factor [G-CSF] and granulocyte–macrophage colony–stimulating factor [GM-CSF]), and some growth factors (TGF-β and PDGF). Most living organisms rely on innate immunity (in the absence of adaptive immunity) for host defense. Cytokines play critical roles in orchestrating the rapid effective response of leukocytes and parenchymal cells to the detection of microorganisms or significant noninfective damage to parenchymal cells. These cells are hardwired with receptors that recognize and respond to common pathogen proteins through Toll-like receptors (TLRs) and danger-associated molecular pattern receptors (1). 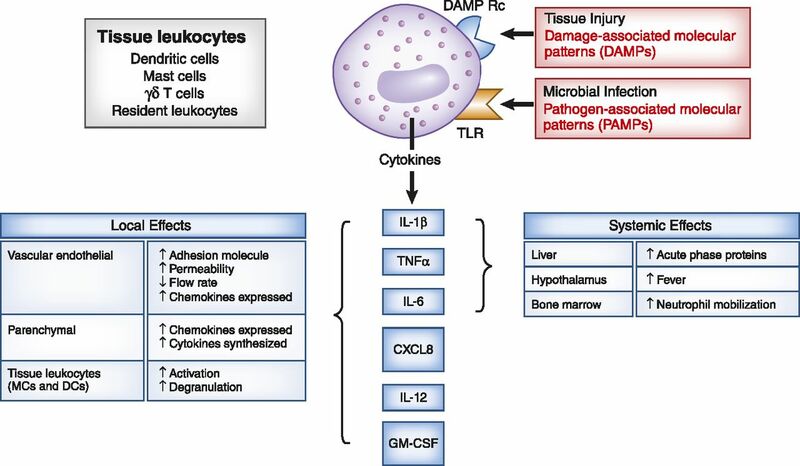 Although leukocytes are the major source of innate cytokine responses, parenchymal cells are increasingly recognized as also producing innate inflammatory cytokines and interacting with leukocytes to optimize cytokine responses in generating host defense. The major acute innate cytokines, IL-1, TNF-α, IL-6, IL-12, CXCL8 (formerly IL-18), G-CSF, and GM-CSF, are used locally to activate endothelial cells and local tissue leukocytes (mast cells [MCs], dendritic cells [DCs], γδ T cells, and neurones), triggering cytokine-mediated amplification loops generating chemokine release, generating endothelial cell adhesion molecule expression, slowing blood flow, and increasing vascular permeability. These changes facilitate the accumulation of humoral defense proteins, complement, coagulation proteins, acute phase proteins, and Ig. They also recruit and activate a range of leukocytes (including innate lymphocytes, γδ T cells, natural killer cells, natural killer T cells [NKT] cells, and innate leukocyte-like cells). The net result of these orchestrated events is inflammation. Concurrently, two further processes are initiated: a cohort of cytokines (IL-1, IL-6, and TNF-α) are generated that act systemically to prepare the whole organism for microbial defense by initiating the acute response syndrome (2) and local foreign material is processed and presented by antigen-presenting cells (APCs) to initiate adaptive immunity. These secondary processes are also critically dependent on cytokine direction and are also responsive to inhibitory cytokine modulation (Figure 1). Production of major acute innate cytokines involved in local and systemic responses following leukocyte activation via TLRs or danger-associated molecular pattern receptors. DC, dendritic cell; GM-CSF, granulocyte-macrophage colony–stimulating factor; MC, mast cell; Rc, receptor; TLR, Toll-like receptor. CD4+ T cells play a central role in adaptive immunity which is characterized by antigen specificity and memory/recall capacity. T-cell specificity is a consequence of the diversity of T cell receptors (TCRs) from which thymic processing eliminates potentially autoreactive T cells to form the T-cell repertoire. Antigen recognition (signal 1) is initiated by TCR binding to antigens ingested, processed, and presented (as peptides) on major histocompatibility complex molecules by specialized APCs. Activation of T cells requires secondary signals provided by costimulatory molecules (including CD40, CD80, and CD86) expressed on APCs to engage CD154 or CD28 on T cells. Innate cytokines released at the time of antigen presentation (a third signal) determine the specific Th subset differentiation pathway the (now activated) T cells will follow. In 1986, Mossman and Coffman demonstrated that there were two separate pathways of Th subset differentiation, Th1 and Th2 (3). Th1 lineage commitment is directed by IL-12, which induces the specific signal transducers and activators of transcription (STAT) factors, STAT4 and T-bet, resulting in the production of effector cytokines, IFN-γ, and TNF-α by the differentiated Th1 cells. Th1 cells activate macrophages to mount cell-mediated immune responses against intracellular pathogens. Th2 differentiation occurs in the presence of IL-4 to activate transcription factors STAT6 and GATA3 producing IL-4, IL-5, IL-9, and IL-13 that drives humoral and IgE mediated immunity. In 2005, a new distinct Th subset was defined on the basis of its predominant production of IL-17, named Th17 cells (4). Lineage commitment of Th17 cells requires TGF-β and IL-6 for the expression of the transcription factors, STAT3 and RORγ-t, whereas maintenance and expansion of Th17 cells relies on IL-23. Activated Th17 cells produce IL-17A-F, IL-21, IL-23, and IL-22 and activate cells, particularly neutrophils, important in host defense against extracellular pathogens. Antigen presentation by TGF-β alone activates Foxp3-inducing regulatory T cells (Tregs), producing IL-10, TGF-β, and IL-35. Tregs play an important role in modulating effector T-cell responses and preventing autoimmunity. Three further Th subsets have been defined: Th9, Th22, and T follicular helper. The Th2 subset is reprogrammed to become Th9 when IL-4 plus TGF-β activates STAT6, IRF4, GATA3, and PU.1 to produce IL-9, IL-10, IL-17, IL-21, and IL-22, promoting tissue inflammation (5). Th22 is important in skin immunity (protection and regeneration). TGF-α and IL-6 activates transcription factor, AHR, to direct the differentiation of IL-22, producing Th22 cells. T follicular helper cells migrate to follicular B-cell zones via CXCR5 where they help B cells activating Bcl-6 to produce IL-21 (6) (Table 1). Many conventional immunomodulating drugs induce their therapeutic effects, at least in part, by attenuating the actions of injurious cytokines. These drugs include glucocorticoids. Their targets include transcription factors, nuclear factor-κ B, and activator protein 1, inducing transcription of inflammatory cytokines (7). They also effect post-translational events, including intracellular signaling and effector cytokine mRNA stability (8). Downstream effects reduce leukocyte trafficking (by attenuating TNF-α– and IL-1β–enhanced endothelial cell adhesion molecule expression). They reduce the number of circulating T cells and inhibit IL-2 production. Th cell differentiation shows a shift to Th2 with attenuation of monocyte IL-12 without effecting IL-10 production. This results in the reduction of Th1 responses favoring Th17 (9). A number of other well established anti-inflammatory drugs (pentoxifylline and thalidomide) also attenuate inflammatory cytokine gene transcription (10). Attempts to biologically target cytokines were led by studies in shock; however, their beneficial effects were limited. Clinical trials in rheumatoid arthritis (RA) and psoriasis were more effective. These studies in RA and psoriasis were facilitated by the capacity to repeatedly access the affected tissues (synovial joints and skin) to determine dominant cytokines and to correlate their presence with disease severity, outcomes, and treatment responses. Administering immunoneutralizing candidate cytokines in synovial and dermal tissues in vitro allows their biologic effect to be studied. Finally, preclinical study of the biologic effects of administering or blocking cytokines in vivo in relevant animal models provided proof of concept for efficacy, specificity, and potential toxicities. The clinical success of anti–TNF-α monoclonal antibodies (mAbs) in human RA and psoriasis helped establish an accepted role for these biologics as mainstream therapeutics (11). Subsequently, anti–TNF-α strategies were successfully applied to other related rheumatologic diseases (12) and then to inflammatory bowel disease (IBD) (13). However, anti–TNF-α therapy was not effective in ANCA vasculitis (14) and multiple sclerosis (MS) (15). A number of different strategies have been used to achieve therapeutic outcomes by cytokine manipulation. Most involve neutralizing cytokine effects in disease either by immunoneutralization or the use of competitive decoy receptors (Table 2). Several potentially therapeutic mAbs targeting other key innate proinflammatory cytokines (particularly IL-1 and IL-6) were developed and tested in a number of inflammatory and autoimmune diseases. There are now five approved therapeutics for rheumatologic use, including RA, ankylosing spondylitis, and psoriatic arthritis. Four are mAbs (infliximab, centolizumab, adalimumab, and golimumab), whereas etanercept is a recombinant human TNF receptor (Rc) fused to the Fc portion of IgG that acts as a competitive inhibitor. These therapeutics modify inflammatory joint damage and systemic inflammatory symptoms (16). Optimal outcomes in RA often require combination of conventional methotrexate with anti–TNF-α mAb (17). IL-6 is a pleiotropic cytokine first described as a T- and B-cell growth factor produced by T cells, macrophages, and endothelial cells. It is a potent inducer of local and systemic inflammation where it plays a key role in the acute phase response (e.g., IL-6 binds to cell surface IL-6Rc and signaling is facilitated by glycoprotein 130). Tocilizumab is a mAb targeting IL-6Ra. This mAb attenuates joint inflammation, bone erosion, and systemic inflammation in RA (18). Tocilizumab is also effective in juvenile RA (Still’s disease) and Castleman’s disease (19). IL-1 is an innate cytokine with powerful capacity to activate macrophages and epithelial cells and acts in concert with IL-6 to induce systemic acute phase responses. It has a natural antagonist, IL-1RA. IL-1RA competitively inhibits IL-1Rc binding by IL-1α and IL-1β. Anakinra is a human recombinant form of IL-1RA. Therapeutically, anakinra has been unsuccessful compared with anti–TNF-α therapy for RA, but it is highly effective in modulating the Cryopyrin-associated periodic syndromes, including neonatal onset multisystem inflammatory disease, Muckle–Wells syndrome, acute and chronic gout, and juvenile RA (20). IL-2 is a growth factor for activated T cells. CD28-dependent costimulation of activated T cells induces expression of the high affinity IL-2 (γ, β, and δ) receptor (CD25). Basiliximab is a mAb designed to bind and block the IL-2Rc on activated T cells. This mAb is widely used to prevent early kidney transplant rejection. A Cochrane systematic review shows that basiliximab is effective at reducing rejection 3 and 6 months postrenal transplantation. Because Tregs express high levels of CD25, there is the potential risk that its efficacy may be limited by its potential effect on blocking immunomodulation. A humanized anti–IL-2Rc mAb, daclizumab shows no apparent differences from basiliximab (21) and has been reported to be effective in treating uveitis in eight of ten patients in an open-label study (22). These dimeric molecules share one chain in common, p40. Targeting p40 offers the opportunity to attenuate both Th1 (driven by IL-12) and Th17 (enhanced by IL-23) pathways of Th differentiation. Ustekinumab and briakinumab are such inhibitory mAbs. They have been assessed in severe refractory Crohn’s disease but without efficacy (23). Ustekinumab is also effective in psoriasis (24). IL-17A is important in host defense by mobilizing and activating neutrophils, whereas pathologic IL-17A responses lead to the development of autoimmunity. Secukinumb is an inhibitory anti–IL-17A mAb and is effective in psoriasis, psoriatic arthritis, and ankylosing spondylitis (25); however, studies in RA show mixed results and no clear consensus of significant benefit (26). Furthermore, in Crohn’s disease treated with secukinumb, no benefit or disease excerbation was observed (27). In a phase II clinical trial, secukinumab treatment showed promising results in MS (28). This cytokine can attenuate the production of inflammatory cytokines. IL-10 is a prominent participant in human inflammatory diseases (e.g., significant amounts can be measured in the synovium of patients with RA). Administration of IL-10 did not attenuate RA activity (29), but it is beneficial in psoriatic arthritis (30). In ulcerative colitis, IL-10 was ineffective when administered at doses that were not associated with side effects, including anemia (31). While strictly speaking, cytotoxic T lymphocyte antigen-4 (CTLA-4) Ig is not primarily a cytokine therapy, blockade of costimulatory molecules essential to adaptive immunity can secondarily block cytokine-mediated inflammation. T-cell surface receptors CD28 and CTLA-4 bind APC ligands CD80 and CD86. CD28 is pivotal in enhancing immune activation, whereas CTLA-4 delivers an inhibitory signal. Abatacept and belatecept are approved by the US Food and Drug Administration for treatment of resistant RA (32). It is effective in this situation; however, it as expected carries a risk of serious infection. Gene therapy has been demonstrated to be an effective way of treating pathologic inflammation. Rheumatoid synovia are arthroscopically removed from patients awaiting joint replacement and transfected with the gene for IL-1RA. Reimplantation of this transfected synovia back into the joint attenuated disease (33). This technique has also been successfully used in collagen arthritis. Blocking cytokine signaling pathways can effectively prevent cytokine participation in inflammatory diseases. A number of small molecular weight inhibitors have progressed to clinical trial; however, specificity and toxicity have limited their progress to the clinic. Janus kinase (JAK) inhibitors are small molecules with multiple effects on cytokine signaling pathways that inhibit the effects of cytokine-induced cell activation and consequent pathologic inflammation (34). Tofacitinib preferentially inhibits JAK-1 and JAK-3. In clinical trials, the degree of benefit in resistant RA was similar in efficacy to adalimumab, a TNF-α inhibitor. It may lack specificity because side effects, including sepsis, disturbed liver function tests, raised creatinine, and neutropenia, were reported during its use (35). Inhibition of spleen kinase signal transduction pathway prevents downstream gene transcription (i.e., synthesis of proinflammatory cytokines). The best studied spleen kinase inhibitor is fostamatinib. It has been successfully used in collagen arthritis in mice (36) and has been studied in >3000 patients with RA in several clinical trials. Responder rates for acute disease were encouraging, but side effects were common (37). Fostamatinib acts by inhibiting TNF-α–induced IL-6 production by fibroblast-like synoviocytes (38). Collectively, data from current clinical trials are insufficient to draw general statements about cytokine therapeutic manipulation in chronic autoimmune inflammatory disease in humans. However, several observations seem appropriate. TNF-α is clearly an important mediator in injurious inflammation in several autoimmune and autoinflammatory diseases. However, there is also evidence to suggest that in other diseases, it is either redundant or potentially immunomodulatory (MS and ANCA vasculitis). IL-1β is also strongly linked to most autoinflammatory diseases and gout. Clinical trials with IL-6 are more limited, it is present together with TNF-α (in RA) and both TNF-α and IL-1β in autoinflammatory diseases. The fact that individual immunoneutralization of IL-6 is beneficial in these diseases suggests independent requirement for the expression of this cytokine. The effectiveness of IL-17 and IL-23 immunoneutralization to attenuate psoriasis and psoriatic arthritis supports the case for these diseases being Th17 mediated. However, TNF-α is also required for the generation of inflammation in this disease because TNF-α neutralization is also beneficial. Although experimental animal models have provided evidence that the CD4+ Th17 subset directs inflammatory injury in RA and IBD, the clinical data available do not support this role in human RA and IBD. However, preliminary data in MS, targeting IL-17, shows evidence of benefit. Although much more data are necessary before firm conclusions can be drawn, these observations on the therapeutic benefit on inhibiting single cytokines suggest that different combinations of cytokine may direct specific patterns of disease (Table 3). There are three renal diseases where there is good evidence that immune cytokines play significant roles in disease pathogenesis and where their therapeutic manipulation could potentially be efficacious. These diseases are AKI, lupus nephritis, and proliferative/crescentic GN. AKI is the most common hospital-based kidney disease (37). Much of our understanding of the mechanisms of injury in AKI come from two experimental models: ischemia reperfusion injury (IRI) and cisplatin-induced AKI. These models highlight the roles of cytokines and leukocytes in mediating injury. This is sterile inflammation. The initiating trigger is followed by tissue stress and necrosis, initiating the production of pathogen-associated molecular pattern molecules (including hypoxia-inducible factor and high-mobility group box 1), inducing the upregulation of leukocyte adhesion molecules, chemokines, and TLR signaling (39). Leukocyte infiltration is rapid and significant, involving neutrophils, monocyte, macrophages, and a variety of T cells (including CD4+ Th1 cells, natural killer cells, NKT cells, γδ T cells, and DCs) (40). Macrophages, DCs, and MCs are potent producers of TNF-α, whereas MCs are the only leukocytes that store presynthesized TNF-α in granules. Blocking degranulation of MCs in cisplatin AKI with disodium cromoglycate prevented the increase of TNF-α in serum and protected from injury (41). Inhibition of TNF-α is also beneficial in endotoxin-, cisplatin-, and ischemia-induced AKI (42,43). IL-1 is responsible for enhancing neutrophil influx in IRI (44). NLRP3 inflammasome knockout (−/−) mice are protected against IRI but not in cisplatin-induced AKI (45). However, caspase-1−/− mice are protected from cisplatin-induced AKI (46), but IL-1β−/− mice are not (47). The role of IL-6 in AKI is complex. Evidence in ischemic AKI is consistent with an injurious role for an endogenous IL-6 (48). However in an HgCl2 model, it was shown that while IL-6–mediated inflammatory responses contributed to injury, IL-6 trans-signaling induced protective responses (49). Cytokine-based immunomodulation can potentially be used as preventative or therapeutic in AKI. The therapeutic potential of administering anti-inflammatory cytokine IL-10 has been demonstrated to be effective in both ischemic and cisplatin-induced AKI (50). More recently, it has been appreciated that Tregs can protect from cisplatin (51) and ischemic AKI (52). Adoptive transfer of Tregs before cisplatin and before ischemia protected from the development of AKI. The number of Tregs required for protection in mice suggests the procedure is feasible in humans. Additionally, transferring Tregs to mice 24 hours after ischemic AKI was beneficial in promoting repair (53). Cytokines released from kidneys with AKI can have significant effects on distal organs by circulatory spillover. Mortality in intensive care units is predicted by distal organ involvement in AKI. Recent studies suggest systemic proinflammatory effects are triggered in three waves by the immune release of host alarm signals (alarmins) from the AKI-damaged kidney (54). This begins with a uric acid surge, which induces a second wave of endothelial cell Weibel–Palade bodies released, which is then followed by a third wave of high-mobility group box 1 protein release. These events are potent triggers for GM-CSF, IFN-γ, CXCL8, G-CSF, IL-12, TNF-α, and IL-6 (55). Recently, renal DCs were implicated in inducing cytokine-mediated injury in ischemic AKI. Renal DCs can powerfully influence AKI by enhancing or attenuating injury. After injury, DCs initiate innate inflammatory responses presenting glycolipids and stimulating NKT cells, recruiting neutrophils and initiating the IL-17/IL-23 signaling pathway. DCs produce TNF-α, IL-6, IL-12, IL-23, IL-17, and IFN-γ to amplify injury and inflammation. However, adenosine A2ARc signaling can attenuate DC activation and protect from injury in ischemic AKI (56). SLE is a disease with evidence of genetic, epigenetic, and environmental contributions. There appears to be many different immune abnormalities associated with this disease, including significant abnormalities of cytokine circuits. It is also likely that there are multiple paths of autoimmunity depending in part on which component of immunomodulation is defective. Although it is likely that cytokines are therapeutic targets in this disease, the known presence of multiple immunoregulatory abnormalities suggests that SLE should not be considered as a single homogenous disease. There is good evidence that IFN-α is an important inducer of antichromatin autoimmunity in patients developing SLE. Early in the disease, it has been demonstrated that immune complexes (containing DNA and/or RNA) are taken up by plasmacytoid DCs by FCγR-mediated internalization. Together with TLR7 and TLR9 stimulation, this induces IFN-α production, driving autoimmunity. Evidence supporting this comes from the high incidence of IFN-α–regulated genes in PBMCs of patients with SLE, the IFN-α signature (57). The levels of serum IFN-α and expression of IFN-α–regulated genes correlate with disease activity, autoantibodies, and complement levels (58). IFN-α signaling pathway polymorphisms have been shown in families with SLE (59). IFN-α is thought to be a promising therapeutic target for SLE, and several mAb inhibitors are in clinical trials. Sifalimumab is a humanized anti–IFN-α mAb. Its use in SLE was associated with reduction in SLE flares and activity (60). In a recent clinical trial, use of rontalizumab (another anti–IFN-α mAb) reduced the expression patterns of IFN-α–driven genes, improved disease severity, and improved flare rates in patients with SLE. However, patients with lupus nephritis were not included in this trial. AGS-009 is an IgG4 humanized mAb that induced significant attenuation of IFN-α signatures after a single dose (61). A novel approach has been to vaccinate patients with SLE with IFN-α–kinoid molecules to induce autoantibodies to IFN-α. All immunized patients returned the IFN-α signature to baseline (62). Mouse models of lupus nephritis have shown both potentially protective and accentuating roles for TNF-α. New Zealand Black (NZB)/New Zealand White (NZW) and MRL/lpr mice with decreased synthetic capacity of TNF-α develop lupus nephritis, but in the kidney, intrarenal expression of TNF-α correlates with disease activity and inflammation (63). In NZB/NZW mice with IFN-α–induced nephritis, anti–TNF-α antibodies attenuate renal inflammation and injury despite maintained immune complex deposition (64). The data on the role of TNF-α is conflicting; hence, the benefits of targeting TNF-α in human lupus nephritis is uncertain. However, there is the general view that there is sufficient data to advise against TNF-α inhibition. Several studies show that circulating levels of TNF-α and renal expression is increased (65); however, other studies show TNF-α production by PBMCs was lower in patients with lupus nephritis than controls (66). Additionally, TNF-α production was associated with reduced TNF-α bioactivity because of high serum levels of TNF receptors, which also correlated with increased disease activity (67). Finally, in patients with lupus nephritis, 10 weeks of infliximab treatment reduced proteinuria but increased anti-DNA antibodies. Longer treatment was associated with adverse effects (68). In patients with RA treated with anti–TNF-α mAbs, lupus syndromes developed, anti-DNAs were induced (69), and some patients developed GN (70). IL-6 is likely to act in concert with type 1 IFNs to induce B-cell autoimmunity in SLE. Its levels are elevated in lupus nephritis and correlate with disease activity (71). IL-6 has been demonstrated in glomerular immune complexes and proximal tubular epithelial cells in lupus nephritis (72). Intrinsic renal cells produce IL-6, and this can be enhanced by anti-DNA antibodies (73). In lupus-prone mice, IL-6 exacerbates GN while inhibiting IL-6 signaling attenuated GN and reducing autoimmunity, therefore enhancing survival (74). Most IL-6 inhibition trials have occurred in RA while data are emerging in SLE. Tocilizumab reduced acute phase reactants, anti–double-stranded DNA antibody, and SELENA-SLEDAI scores in patients with moderately active lupus nephritis (75). A number of biologic interventions target molecules or immune cells upstream of cytokine production. The beneficial effects are likely to result from their effects on cytokine mediation of target organ inflammation. B-cell activating factor is also known as B lymphocyte stimulator and is essential for B-cell maturation, survival, and Ig class switching. Its levels are elevated in SLE and correlate with disease activity and flares (76). Belimumab, a humanized anti-B lymphocyte stimulator mAb has been shown in two trials to demonstrate a modest but significant benefit in reducing disease activity. Patients with lupus nephritis were excluded, but in one trial, 15% of patients had evidence of nephritis. A post hoc analysis showed significant reduction in proteinuria. Trials in lupus nephritis are underway (77,78). The data at hand do not provide evidence for CTLA4-Ig efficacy in the treatment of lupus nephritis. A phase IIb trial involving patients with lupus with polyarthritis and discoid lupus did not meet its primary or secondary end point, flare prevention, and the infection incidence was significantly higher in the abatacept arm (79). In another 12-month trial of abatacept or placebo, intravenous infusion plus steroid and mycophenolate mofetil were compared in patients with class III and class IV lupus nephritis. Complete response and renal improvement criteria were the same in all groups. Infection was not higher in the abatacept group (80). Anti–TNF-Related Weak Inducer of Apoptosis. There is growing evidence for the anti–TNF-related weak inducer of apoptosis (Tweak)/factor inducible 14 pathway in enhancing injury in lupus nephritis. In lupus nephritis, Tweak and its receptor are upregulated in renal tubular cells, inducing proinflammatory cytokines, including IL-6, adhesion molecules, and chemokines (81). Immunoneutralization of Tweak decreases renal inflammation in murine models (82), and these mAb are being studied in lupus nephritis (ClinicalTrials.gov identifier: NCT0130890). Laquinimod is a small molecule that immunomodulates APCs to redirect Th subset differentiation with downregulation of IL-6, IL-12, IL-23, IL-17, and TNF-α and increased IL-10. In experimental murine lupus, laquinimod delayed the onset of lupus nephritis. When administered as a therapeutic, it attenuated disease severity by reducing IFN-γ and IL-17A production by splenocytes while enhancing IL-10 and Treg frequency (83). In a phase II study in active lupus nephritis, mycophenolate mofetil and high-dose steroid were administered with or without laquinimod. Laquinimod had an additive effect with renal function and proteinuria improvement. Adverse effects were not observed (84). Despite many trials of therapeutics that attenuate cytokine action being performed in SLE, there is still much that needs to be understood about the role of cytokines in this disease. Unfortunately, the simple application of therapies successful in other immune inflammatory diseases (as in the case of anti–TNF-α immune neutralization) appears to be much more problematic in SLE. Finally, the diversity of patterns of disease and the involvement of different organs means lupus nephritis is unfortunately an exclusion in many trials, denying these patients the opportunity for potentially more effective treatments. Experimental Antiglomerular Basement Membrane Glomerulonephritis. Experimental antiglomerular basement membrane (GBM) GN is the most widely studied animal model of human crescentic GN. There is considerable data showing that immune cytokines are critically involved in inducing nephritogenic autoimmunity and mediating glomerular injury in these models. Moreover, studies in this model provide proof of concept that the inhibition of selected cytokines can prevent and treat disease. Numerous innate cytokines have been associated with pathogenesis of anti-GBM GN. A pathogenic role in anti-GBM GN has been demonstrated for each of the following innate cytokines: GM-CSF, G-CSF, IL-1β, TNF-α, and CXCL8, by studies in cytokine gene–deleted mice. All of these innate cytokines recruit inflammatory cells to the kidney and direct the subsequent development of anti-GBM GN. Gene deletion of the key Th1 cytokines (IL-12 and IFN-γ) resulted in attenuated crescentic GN, and gene deletion of the key Th1 transcription factor (T-bet) is protective (85,86). After the discovery of the CD4+ Th17 subset, studies using mice deficient in p19, p35, and p40 (components of the key Th1 and Th17 cytokines, IL-12 and IL-23, respectively) were used to analyze the relative contributions of each Th subset in anti-GBM GN. Paust et al. demonstrated that Th17 cells contributes to anti-GBM GN with the use of IL-23p19−/− and IL-17A−/− mice (87), whereas Odobasic et al. examined the reciprocal relationship between Th1 and Th17 and demonstrated that early nephritogenic responses were mediated by Th17 cells, but late disease is Th1 dependent. They also demonstrated that each Th subset counter-regulated the other (88). Furthermore, Steinmetz et al. used mice with gene deletion of RORγ-t, the key Th17 transcription factor, to confirm the participation of the CD4+ Th17 subset (89). Direct comparison has been made between the effects of transferring Th17 and Th1 polarized ovalbumin (OVA) specific CD4+ TCR transgenic cells into naïve mice with OVA planted on the GBM using a non-nephritogenic anti-GBM/OVA conjugated antibody. Transfer of both CD4+ T-cell clones induced GN. However, transfer of Th1-polarized cells induced a monocyte and macrophage predominant infiltrate lesion, whereas Th17-polarized cells induced less injury with a neutrophil predominant infiltrate (90). To assess key Th2 cytokines, anti-GBM GN was induced in IL-4−/− and IL-10−/− mice. Both groups had augmented Th1 responses and increased glomerular injury, whereas infusion of IL-10 attenuated disease. Tregs are not only important in maintaining self-tolerance but are also necessary in controlling overt inflammatory responses. Transfer of Tregs (CD4+CD25+) before and after the induction of experimental anti-GBM GN suppressed the development of GN by reducing Th1 responses (91). Interestingly, Eller et al. demonstrated that Treg-derived IL-9 is essential for the recruitment of MCs, and both are required to attenuate anti-GBM GN (92). Cytokine Production by Resident Renal Cells. Resident cells within the kidney, including tubular and glomerular cells, interact with infiltrating leukocytes resulting in their synthesis of injurious TNF-α in response to leukocyte-produced IL-1 (73). The relative roles of leukocyte and resident cytokine production have been studied in anti-GBM GN in mice using cytokine chimeric mice where the cytokine gene has been deleted from either bone marrow–derived leukocytes or from resident renal cells (86). Nonchimeric TNF-α−/− mice are significantly protected from the development of GN. When the TNF-α gene is knocked out from resident cells, similar attenuation was observed, whereas knockout of the TNF-α gene in bone marrow only caused mild protection, suggesting that TNF-α produced by resident cells is the major source of injurious TNF-α in this disease. These studies also produced evidence of complex cytokine interactions between resident cells and infiltrating leukocytes. Studies with IL-1β−/− and IL-1R1−/− mice showed that IL-1β mainly derived from leukocytes actives IL-1R1 on resident cells, inducing TNF-α production that causes significant glomerular injury (86) (Figure 2). 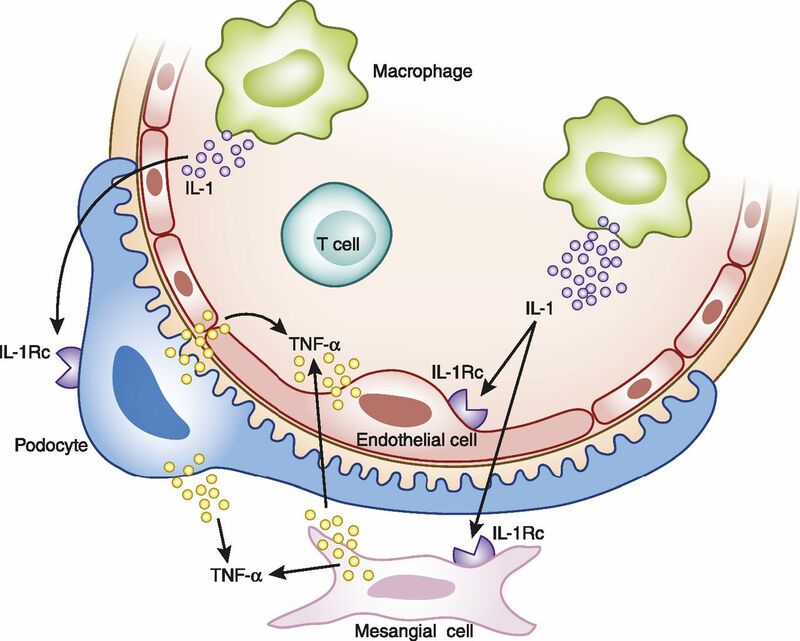 Innate macrophages produce IL-1 which binds to IL-1Rc on intrinsic renal cells (endothelial cells, podocytes, and mesangial cells) to produce injurious TNF-α that amplifies T effector cell responses resulting in crescent formation and glomerular injury. Rc, receptor. In autoimmune anti-GBM GN, the target autoantigen is the noncollagenase domain of the alpha 3 chain of type IV collagen. Immunization with this antigen induces autoimmunity shown by the production of circulating anti-GBM antibodies and the development of crescentic GN. IFN-γ−/− mice developed worse disease. The relative contributions of Th1 and Th17 to disease development were assessed using p35−/− (deficient in Th1 subset) and p19−/− (deficient in Th17 subset) mice. The p19−/− mice were protected from GN, but the p35−/− mice were unaffected compared with controls, confirming a pathogenic role for Th17 but not for Th1 in this disease. The most common cause of crescentic GN is ANCA-associated vasculitis (AAV). Evidence suggests cytokines directing the underlying nephritogenic autoimmunity are likely to be therapeutic targets that could be neutralized with available biologic agents. PBMCs from patients with ANCA-associated GN have CD4+ T cells that proliferate when stimulated with the target autoantigens, proteinase 3 or myeloperoxidase (MPO) (93). In treatment of refractory disease with T cell–specific targeted therapies, antithymocyte globulin was beneficial and capable of inducing remission (94). Furthermore, cytokine profiling of biopsied nasal mucosal tissue, bronchoalveolar lavage, and PBMCs from patients with granulomatous polyangiitis demonstrated increased expression of IFN-γ, denoting a Th1 cytokine pattern (95). Nogueira et al. found that in the serum of acute or convalescent AAV patients, IL-17A and IL-23 levels were increased, and this correlated with disease severity and ANCA titer (96). IL-6 was also elevated in active disease. Chavele et al. reported that in patients with MPO-AAV, MPO-stimulated recall responses showed elevated IFN-γ (97). Collectively, these data provide evidence in support of both Th1 and Th17 involvement in AAV. Furthermore, IL-17–producing cells were found in renal biopsies from patients with acute vasculitis, and most of the IL-17–positive cells present were innate leukocytes (neutrophils and MCs) (98). In experimental MPO-ANCA GN, IL-17A−/− mice were protected from the development of anti-MPO autoimmunity and glomerular injury (99). Immunoneutralization of TNF-α caused significant reduction in lung hemorrhage and renal injury in Wistar–Kyoto rats with induced anti-MPO AAV (100). The only cytokine-based clinical trials in AAV have been of anti–TNF-α. Treatment with etanercept (anti–TNF-α mAb) was not effective and was associated with a high rate of treatment-related adverse side effects (101). A smaller clinical trial using adalimumab with prednisolone plus cyclophosphamide showed similar efficacy to using these drugs but afforded with less steroid exposure (102). The evidence outlined here suggests that there are important renal diseases that may benefit from the application of well targeted biologic therapies on the basis of cytokine manipulation. Innate cytokines are prominent participants in many forms of AKI. Moreover, in some clinical settings, such as renal transplantation, high-risk surgery (e.g., elective coronary grafting), and for optimal use of effective chemotherapeutics (nephrotoxic dose-limited like cisplatin), the opportunity exists to preemptively block likely injurious cytokine pathways.There is a need for more selective, less toxic therapies to treat autoimmune inflammatory forms of proliferative/crescentic GN, including lupus nephritis, anti-GBM, and ANCA-associated disease. These represent the more serious and inflammatory categories of theses autoimmune diseases. They share features of other diseases, such as RA and IBD, where new biologics are now part of the therapeutic pharmacopeia. The initial attempt to introduce anti–TNF-α mAbs in AAV was disappointing. It should remind us that translation of therapies from one disease to another is not simple or without risk, but without well managed risk, there will be no progress. Perhaps we should apply the principles behind the introduction of anti–TNF-α to RA, use tissue samples from patients with active disease to assess the dominant cytokines in active untreated disease, assess the effects of these cytokines on relevant renal tissues in vitro, and use relevant animal models to provide proof of concept for the specificity, efficacy, and minimal toxicity in preclinical trials. Clinical trials with the greatest likelihood of success are those that target dominant cytokines in renal diseases using immunoneutralising mAbs where minimal toxicity and clinical effectiveness has already been shown in other chronic autoimmune and or autoinflammatory disease. Using these criteria we could now be planning clinical trials for targeting the major innate cytokine as prophylaxis and treatment and considering neutralizing mAbs to IL-17 and IL-23 in ANCA vasculitis.